Chipped, broken, or decayed teeth will often deteriorate quickly and painfully without the immediate intervention of a dentist. At Go Dental in Calgary, our dentists are proud to offer restorative services such as dental crowns. Dental crowns, also known as caps, are hollow, artificial teeth used to cover traumatized or decayed teeth, in order to protect the natural tooth structure from further damage. Additionally, crowns are a popular restorative option among patients who have undergone a root canal, or other major dental procedure, because teeth that have been repaired with crowns look and work very much like natural teeth. What Types of Dental Crowns are Available at Go Dental in Calgary? There are a variety of dental crown materials at your dentist’s disposal. They will suggest specific materials depending on the tooth being crowned, based on functionality and aesthetics. Generally manufactured from gold alloy, palladium, nickel or chromium, metal crowns can last a relatively long time, and are highly resistant to chipping or breaking. Aesthetically speaking, due to their metallic colour, these types of crowns are commonly reserved for back molars that are not immediately apparent when smiling. Structurally, they work best on molars because they can handle vigorous chewing. More natural-looking than metal crowns, but similarly sturdy, these composite crowns are often placed on mid to front teeth. They wear a little easier from chewing than metal crowns, therefore are seldom placed on rear molars. As the most natural-looking crown option available, these will most often be placed on visible front teeth. In terms of sturdiness, porcelain crowns are more prone to chipping than metal or composite and, as such, are not recommended for molars primarily used for chewing. Natural-looking, and much stronger than porcelain or composite crowns, this option offers you the best of both worlds. They can be placed on front teeth, or back molars, and will provide you with an aesthetically pleasing smile, as well as resilient and sturdy chewing functionality. 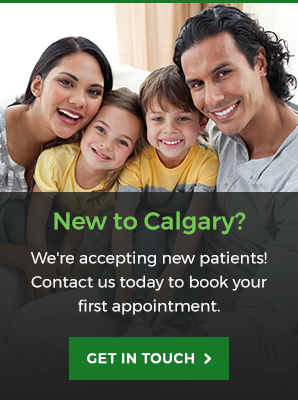 For more information about dental crowns or to schedule an appointment with one of our Calgary dentists, contact Go Dental today!